The global cardiac biomarker diagnostic kits market was valued at US$ 2,100 Mn in 2017. It is anticipated to reach US$ 3,300 Bn by 2026, expanding at a CAGR of 5.4% from 2018 to 2026. Launch of high sensitivity cardiac biomarker kits, focus on research and development and new product launches by market players, strategic acquisitions and partnerships to enhance their geographic presence, rising prevalence of cardiac diseases, and shift in focus of the population toward treatment of chronic and lifestyle diseases are fuelling the market. The global cardiac biomarker diagnostic kits market has been segmented based on product, disease indication, testing, end-user, and region. Based on product, the troponin test kits segment is projected to lead the market, in terms of revenue, and dominate the market during the forecast period, followed by the BNP test kit segment. It is anticipated to remain dominant during the forecast period. Expansion of the segment can be attributed to a rise in the demand for performing high sensitive troponin assay. Furthermore, increase in applications, owing to the growing focus on research in troponin to understand the interactions, and increasing number of studies on troponin interactions to streamline the cardiac biomarker development process are driving the segment. In terms of end-user, the global cardiac biomarker diagnostic kits market has been categorized into hospitals, diagnostic centers, clinics, and others. Hospitals & diagnostic laboratories are an important channel for the usage of diagnostic products & offer a range of diagnosis solutions. They are an important channel for the usage of diagnostic products. In terms of disease indication, the global cardiac biomarker diagnostic kits market has been classified into angina pectoris, myocardial infraction, cardiac heart failure, and others. The angina pectoris segment accounted for a major share of the global cardiac biomarker diagnostic kits market in 2017. The global market for cardiac biomarker diagnostic kits is driven primarily by the growing prevalence of cardiac disease that can lead to incidence of myocardial infraction, cardiac heart failure, and angina pectoris. Additionally, the concomitant rise in the associated mortality in worldwide population is fueling the demand for cardiac biomarker diagnostic kits. Rising demand for laboratory investigation for the diagnosis of cardiac diseases is propelling the market. In terms of region, the global cardiac biomarker diagnostic kits market has been segmented into North America, Europe, Asia Pacific, Latin America, and Middle East & Africa. North America dominated the global cardiac biomarker diagnostic kits market, in terms of revenue, in 2017. It is projected to maintain its dominance during the forecast period. Presence of well-established players in the region and increasing research and development activities by these players are key attributable factors for North America’s dominance of the global cardiac biomarker diagnostic kits market. Asia Pacific is projected to be a highly attractive market for cardiac biomarker diagnostic kits, and the region is likely to exhibit a high attractiveness index. The market in Asia Pacific is projected to expand at a high CAGR during the forecast period, due to the rise of cardiac disease diagnosis which are expanding in countries in Asia Pacific. This, in turn, is attributable to well-developed health care infrastructure, increase in health care expenditure, and rise in the number of local manufacturers providing innovative products at lower cost. The market in Latin America is expected to expand at a moderate pace during the forecast period. Major players operating in the global cardiac biomarker diagnostic kits market are Abbott Laboratories, Hoffmann-La Roche AG, Bio-Rad Laboratories, Danaher Corporation, Siemens Healthineers, Thermo Fisher Scientific, bioMérieux, Randox Laboratories Ltd., and Ortho Clinical Diagnostics. They account for a significant share of the global market. The market is characterized by a large number of acquisitions, which has led to market consolidation and increasing dominance of the top players. In 2017, Abbott completed its acquisition of Alere, concluding a deal first announced in February 2016. 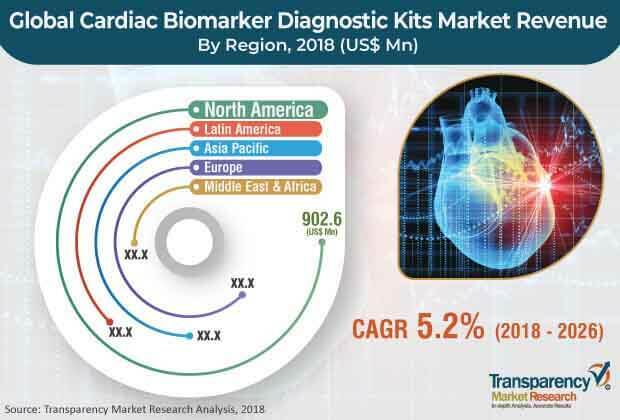 Companies operating in the cardiac biomarker diagnostic kits are focused on increasing their geographic presence by means of strategic collaborations with leading players in their respective domains and geographies.